And scrub them in between (with hand motion scrubbing between fingers). Germs go down the drain HEY! Set a timer for 20 seconds when your child washes their hands. Also, try new scents of soaps to make it more fun. See if your child can guess what the scent is! Talk about when to wash your hands. Ask your child before and after what activities they think they should wash their hands. After washing your hands, clap them! 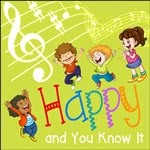 Watch and sing “If You’re Happy and You Know It” on Tumblebooks.